Farming is filled with uncertainty. And that makes farm management decisions far from easy. Should I top dress my wheat? Should I spray fungicide on my beans? The markets have rallied nicely this week, should I sell? Unfortunately, we’ll only know the outcome of most farm management decisions until after the fact. 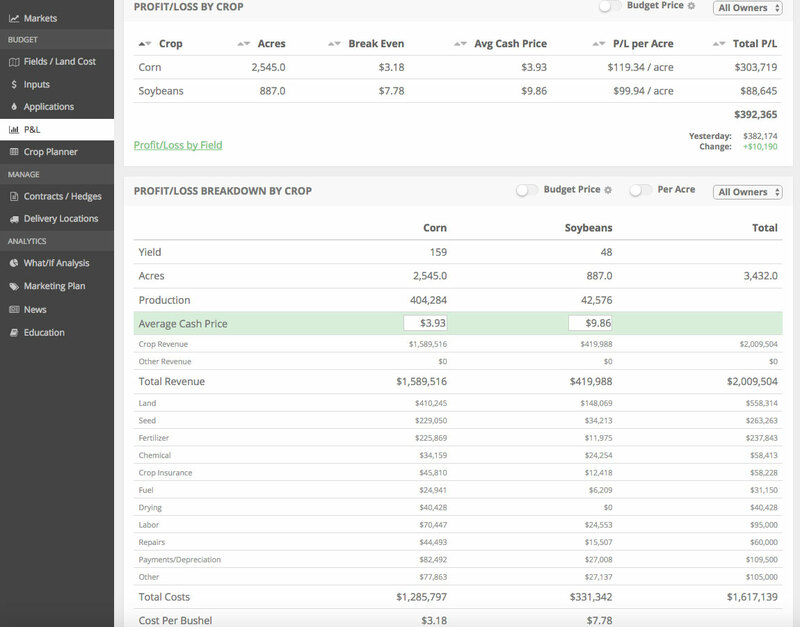 As we’ve mentioned many times, farming is a unique business where the two main factors that control revenue (weather & commodity markets) are completely outside of a producer’s control. When faced with forward-looking decisions, this lack of control naturally reduces the certainty of acheiving the desired outcome. In more simple terms, it’s very easy to judge past decisions as either “that was a great decision” or “that was idiotic”. Hindsight is 20/20! Given this lack of certainty producers should use a simple statistical formula to help guide their decisions. This formula is called Expected Value. Here’s the “textbook” definition of Expected Value (Source). Lets walk through a theoretical example. You’re presented with the opportunity to invest $100,000 for a 5% stake in an up-and-coming business (for example purposes only, don’t read into the probabilities too much). The next step is to assign probabilities to a variety of different outcomes. The next step is to multiple each value by it’s probability and take that times your ownership stake (assuming no dilution which is a conversation for another day). 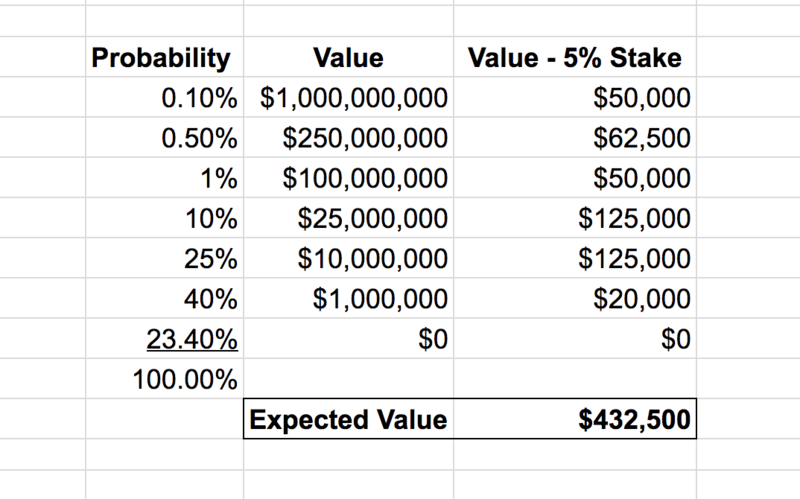 As you can see, the expected value exceeds the investment so this looks like an attractive deal. Important note below…. The higher the certainty in your probabilities, the less return you would need to find the investment attractive. In the example above, the probabilites are simply a “shot in the dark”. Knowing your probabilities with any degree of certaintiy is very hard! This is where your farm expertise is vital in the process. Let’s look at an example where it’s arguably a bit easier to define the proabilities. You have a “wet” farm that has a history of not getting planted. Based on your experience and current ground conditions, you assign a 15% likelihood of this field not getting planted next year. Once again, this is just an example. You should use the 15% likelihood of no return on this investment in your farm input decisions. Fall applying your nitrogen (at $50/acre) is “costing” you $7.50/acre ($50 x the 15% of no ROI). Is this cost worth the benefits? This is all easier said than done, I know. But a statiscally-based approach to decision making will help add definition and structure to the very uncertain job of farming. This statisically-based approach is the building block for a long-term successful farm. Instead of letting unfavorable outcomes hamper your future decisions, realize that this is simply the inescapable reality of farming. If you haven’t signed up for our free newsletter, please do so below!